Larimar is a rare form of pectolite, with unusual sea blue coloration found only in the Dominican Republic. Colors can range with beautiful hues of white, light blue to blue-green. 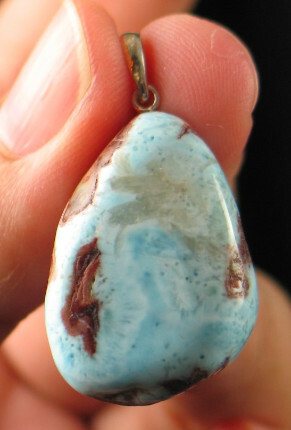 Larimar has a cooling effect on the throat chakra and is excellent for working with throat and lung issues. Because it has a good cooling effect, it’s great for working against fevers and infection. It assists one to communicate one’s emotional boundaries so that others hear, accept, and respect them. 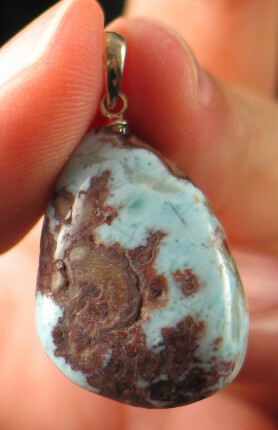 Wearing Larimar can assist one to speak from their inner wisdom. Its energy is very soothing relieving stress and teaches one to relax. Larmiar's energy brings about a gentle joy too. 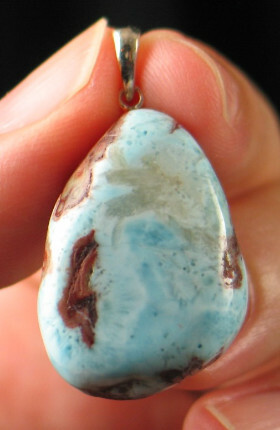 Larimar is quite absorbent to negative energies. Keep this beautiful stone energetically strong clear by placing on white selenite after each working session.